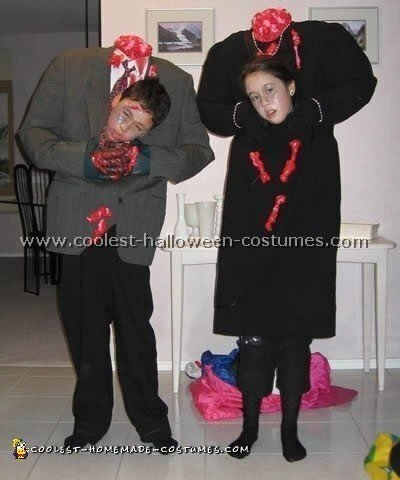 This scary Halloween costume was so easy to make and people loved to look at it. My son won first place for a local contest. All I used to make it was a rolling back pack with the handle pulled all the way up and then taped. I stuffed the shirt with Polly fill and a towel and bought the pants, shirt and apron at a thrift store for $1 and got a disposable pan and fake blood. I used hands that we had from years before and I taped them to the shirt. 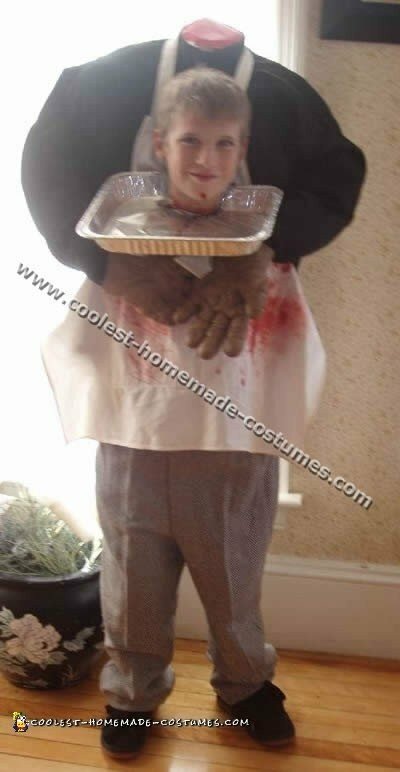 The cut off head was made from a bowl turned upside down and a white paper plate taped on to it with fake blood. My son loved all the attention he got from this costume. I wanted to create a scary Halloween costume this year. So I purchased a dress at a thrift store as well as a piece of luggage that also included backpack straps. I cut the backpack in half and built shoulders out of Styrofoam. Then I stuffed the arms with toilet paper and created some breasts with miscellaneous stuffing items. The neck was actually a practice head used at a well known Seattle salon. I severed the head and then added lots of fake blood. I cut a slot for my own head to come through and the costume was complete. 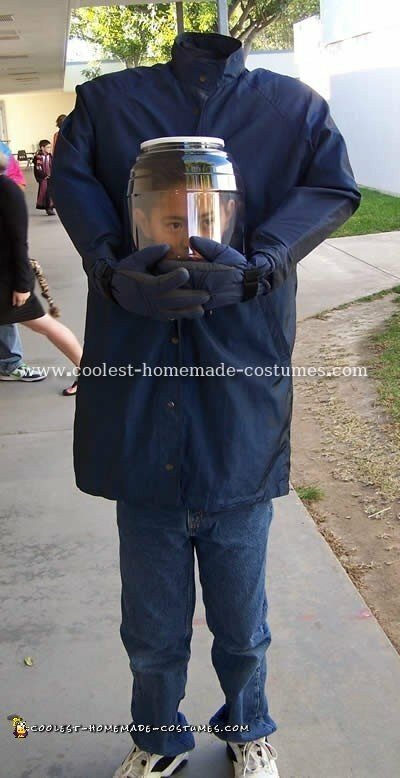 This is a very easy, inexpensive, functional and scary Halloween costume. Initially found the idea for a scary Halloween costume on your great site. The key difference was to use spray foam insulation to form shoulders and neck. I made up a rectangular box out of cardboard, waxed if possible. (Approximately 4 x 20 inch).cut a hole in the center of it in the bottom and made another round box cavity for the neck part and taping it on. Have to layer the spray foam and let dry then add and keep adding layers or it will never dry if you fill complete box up. After it is dry you can peel off the cardboard and shape shoulders and neck with a knife. You may have air pockets in the neck which is where I inserted the nozzle and I sprayed a little more foam in to spew out and make it look really gory. If there are no air pockets drill a few holes in the neck and paint red. I then took the idea of using backpacks so I drilled two holes in the bottom of the shoulders and attached 3/4 poly b plumbing pipes about 2 ft long to the shoulders and taped on the sides of the backpacks. Dress them accordingly (had to cut the crotch out on the pants to get them high enough and over the backpack). 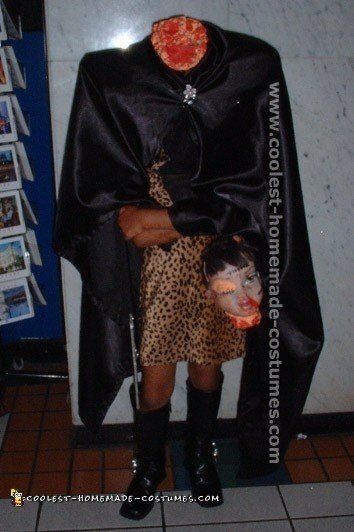 This costume is a variation of the “headless-boy” costume we’ve made in previous years that was just too spooky! It’s easy to make out of cardboard and old clothes. You simply use cardboard to build some fake shoulders and fake arms that rest on the child’s shoulders. Then you use an old trench coat that is long enough to cover the fake shoulders down past the knees with your child’s real arms hidden inside. Have your child lean slightly forward and button the trench coat around their neck. Safety pin gloves to the fake arms and then pin them gloves together in front with the fingers interlaced at the level of your child’s real chin. The jar was a recycled pretzel container with the bottom and back cut out. I also cut out most of the white lid and lined with a piece of old white t-shirt to maximize air flow. Place the jar on his head and position the fake arms and hands to cover the bottom of the jar to create the illusion that he is carrying his head in a jar. At night we put a small glow-stick in the jar and the fog from his breath made it look like his head was floating in green mist. 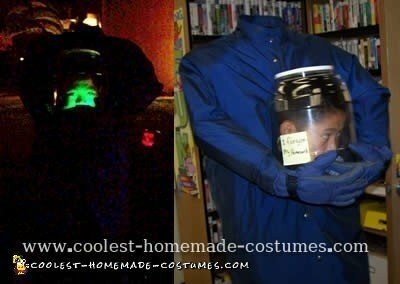 It’s a fantastic Halloween costume that can be made with just things you find in your house! My 9 year old got the idea of Headless Helen from a remark made in a Disney Movie. It was my job to make this scary Halloween costume. I used her old rolling backpack. The frame and strap were still in good condition though the back-pack itself was trashed. I cut off the back-pack, attached a plastic hanger to the retractable handle and glued the back-pack extension rods to the height of the headless ghoul (so it didn’t retract anymore). Then I got an old skirt and blouse, bought a pair of cotton gloves which were sewn into the sleeves and stuffed with tissue. I used packing material (air bags) for the upper body and twisted paper for the arms. I taped all this stuffing to the extension arms (for the backpack). This made it light and easy to carry. She wore a pair of rain boots, pulled the skirt up to her chest and poked her head through a hole we made in the blouse. (A buttoned up front may have been easier in retrospect). Also your headless zombie will have “no hands” to hold a treat bag as her arms are in the skirt. So we got a treat pouch and fastened it to the front of the skirt. The costume was such a hit we often received additional treats just for being “the best scary Halloween costume” seen all night. She got A LOT of attention and stares and was photographed several times by people who were just in awe. It was certainly a costume to lose your head over! 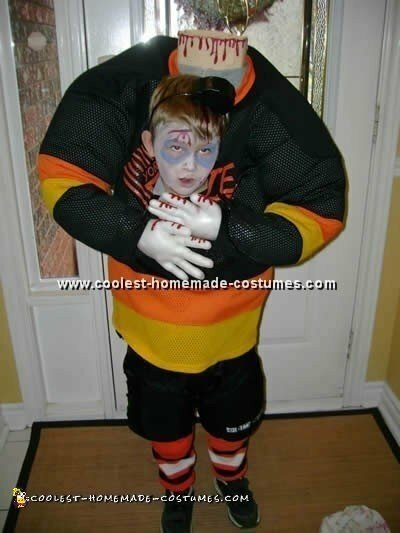 My son had the great idea of a scary Halloween costume by being a 2 headed hockey player but I couldn’t get my hands on a wig head form. So next best we thought of “Headless Hockey Player”!! I went to the Salvation Army and bought a men’s hockey jersey that matched some hockey socks he already had. I took an old top of my husbands and stuffed the arms and torso. After testing it out on my son, I it to be too floppy. So we took the stuffing out of the top part and replaced it with a box cut to rest on his shoulders. I taped 2 plastic hockey sticks together and then taped them to the box to give it stability. This whole contraption went on his shoulders held in place by his hockey pants and a belt around the plastic hockey sticks and his torso. We cut a hole in the middle of the hockey shirt and popped his head out. On the ends of the stuffed arms I taped rubber gloves stuffed with poly stuffing to create hands. These were pinned under my sons chin to look as if he was holding his head. We formed a neck piece out of cardboard and felt and painted on some realistic blood drips. The piece de resistance was a headband with a partial hockey puck on it to make it look like to be stuck in his head, scary Halloween costume or not? I made it out of cardboard duct tape and black electrician’s tape. He wore his hockey pants and socks to finish off the costume. The only thing I bought was the hockey shirt….everything else were things we had around the house! 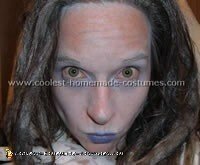 My best friend Megan likes scary movies so thought of this scary Halloween costume. My mom helped me make it. First we bought a black robe (adult size). Then we tried a few different things to make the shoulders that didn’t work. We ended up buying a hikers backpack at a thrift store for $3 and attached some Styrofoam to it to make the upper body. In order for my head to stick through, we cut a hole in the front of the robe. We filled the arms with stuffing and sewed on stuffed black gloves to look like hands holding my head. At the top of the shoulders we made a neck stump out of paper and covered with masking tape then just used markers to make it look like blood. I wore black clothes underneath and kept my arms inside the robe. I put on some makeup and messed up my hair. Everyone thought it was real scary Halloween costume. I got this great idea for a scary Halloween costume from this site. For the upper body we used Styrofoam about 4″ thick. Just cut the Styrofoam to form shoulders and taper a bit to form the waste. The neck was made out of paper mache and we got the “tall dress” from a 2nd had clothing store. The hands were stuffed rubber gloves and the tray was a piece of cardboard covered with an old dish towel. This is our headless scary Halloween costume. It was easy. We found a dress that was taller than my 7-year-old daughter. She is wearing a backpack that has two pipes that are the “shoulders” of the woman. We cut a hole for my daughter’s head and put wire in the arms with cotton stuffing. Our scary Halloween costume got a LOT of comments and we won first prize at a contest! She had fun in it. It really made people have double takes! I even made the knife out of cardboard and papier-mache! For this scary Halloween costume, I wanted to make something really spooky. I read about other headless costumes and wanted to make my own. This time I got lucky and I had JUST purchased a dress that was Too BIG for my daughter! I put it on her and stretched the dressed up over her head! It happened that the dress was made up of netting in the front so she could “see through” it! 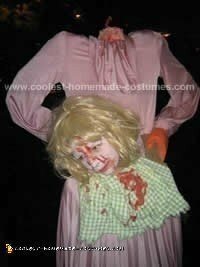 For the “neck” of the scary Halloween costume I put a colander over her head and on the “top” I made a papier-mache “cut off neck!” I painted it pink (flesh color) and then red for the blood! To top it off, we added a black satin cape, Mary-Kate and Ashley boots and I made her a cleaver with blood on it! For the head we used her “Bratz” head and covered the eye over and painted it flesh and painted “stitches” in it! Then we cut a hole in the BACK of the head and inserted COOKED spaghetti. So she pretended to CUT the dolls head, then she pulled out the “brains”. Our scary Halloween costume made people squirm!! 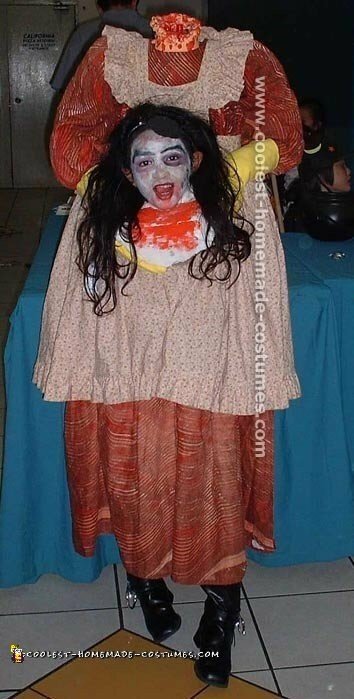 This scary Halloween costume was made using a box, two old shirts of my husbands, some quilt batting, a set of rubber arms and hands that we purchased down the Halloween aisle at Walmart, pillow stuffing, packing tape and a safety pin [oh, and my sons head, but he was willing to donate it :)]. It took about a week to gather all the materials for the scary Halloween costume and put it together. First I padded the outside of the box with the quilt batting, which I just tacked at the edges with packing tape. We used a large box, big enough to fit over my son’s shoulders, but it was still tight enough that it didn’t move around. I tried to make the “shoulders” of the box look a bit more rounded by using the batting. To get the box to rest just right so his head would stick through a hole in front, I flipped the box upside down and placed a ledge I made with cardboard inside, then padded it with 2 layers of batting so it would rest right on top of his head. The ledge of cardboard was approximately 5-7 inches from the top of the outside box. I secured it with really strong packing tape so it wouldn’t come loose throughout the night. The box was fairly tight when I slipped it over his shoulders, so it didn’t move around when he walked, ran or bent over. The bottom of the box rested a bit below his shoulders but not quite to his elbows, so he still had enough movement of his arms to put them out in front of him if he needed to scratch his face or keep himself from falling. I cut a hole in the front of the box that my son’s head would fit through. I also cut a hole in the top of the box and lined it with a grocery bag [tape the edges of the grocery bag right outside the hole on the box top, before you put on the shirt, you’ll see the reason for this later :)]. Next I put the black t-shirt on the box, then cut a hole in the front of the t-shirt and wrapped the edges of the t-shirt that I’d cut away over the box hole so you couldn’t see box edges. Using the t-shirt to cover the cut edges made it easier for my sons head to rest in the hole all night. Then I put the button-down shirt over the box and filled the arms with pillow stuffing. I ran the fake arms/hands up in the shirtsleeves and it was done :). 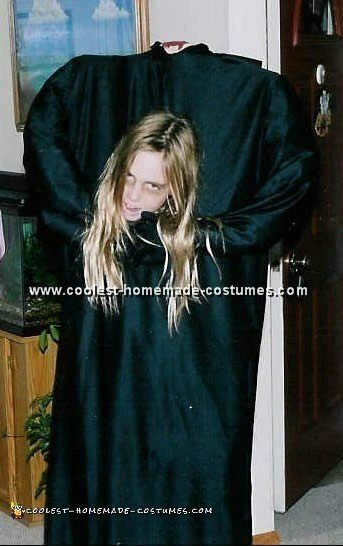 The way you wear this scary Halloween costume is that you slip the box over the person in it. They put their head through the hole in front and the box rests on their shoulders. They’ll need to wear some larger pants (maybe dads pants) and pull them up to their chest. Put their arms down in the pants or they can cross their arms in front of them. (This is a bit safer if your child is prone to fall, so they can catch themselves). Put on a belt so that the pants don’t fall down. After you get the box fixed on them so that it’s not moving, you pull both arms up to where the hands are cradling the face sticking out and safety pin them together, either on the black shirt or together at the wrist so it looks like the rubber hands are holding the head of the scary Halloween costume. Now back to that hole in the top, lined with the grocery bag. Well, as you can see from this scary Halloween costume photo, the trick or treater would be hard pressed to reach to take candy and there wasn’t a way to carry the trick or treat bag. So we just let everyone drop the candy down in to the poor guys neck, and in to that grocery bag. After 2-3 houses I would empty the sack into another one that I carried for him so that the top of the scary Halloween costume wouldn’t get too heavy for him. 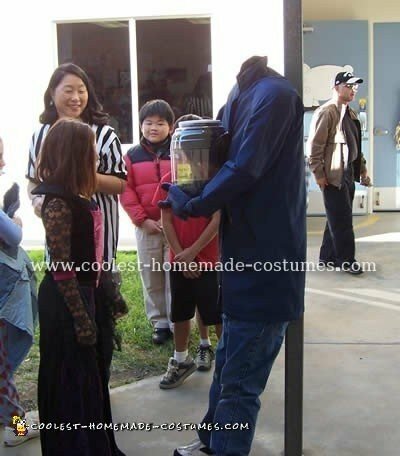 All in all people thought it was hilarious, just be warned when you catch a glimpse of this scary Halloween costume from behind and your child is running from house to house, it really does look like a headless person on a hunt for candy and you might find yourself rolling with laughter. PS – This scary Halloween costume is only for kids who have a GREAT sense of humor, as it gets lots of attention and plenty of laughter. 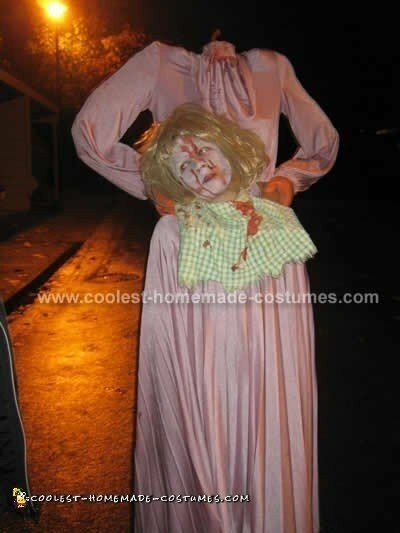 A child that felt they were being made fun of would not have a good time in this scary Halloween costume!